Heat half table spoon oil in a pan. Add 1 tea spoon jeera. When jeera starts spluttering add 2 table spoons chana dal, 1 tea spoon urad dal and fry until chana dal turns golden color. Add chopped green chillies, fry for few sec. and switch off the flame. Let the ingredients cool. Wash dhaniya leaves, drain and chop finely. 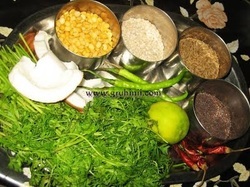 Now grind the ingredients, chopped dhaniya, grated coconut and salt to fine paste adding sufficient water. Add 2 tea spoons (appox. as per taste) of lemon juice and mix well. Take the chutney into a bowl.